The cultural heritage of the world provides assets for design, says Princess Dana Firas of Jordan, who also serves as president of the Petra National Trust. “Cultural heritage unleashes creativity. 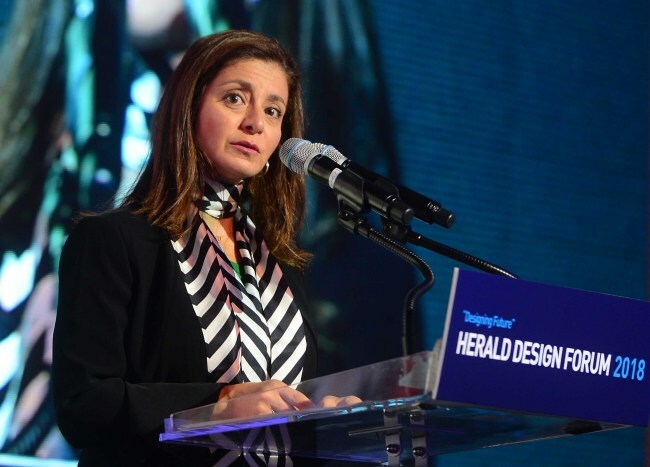 It focuses on human aspects of our development,” Princess Dana said at Herald Design Forum 2018 in Seoul on Friday. Princess Dana, the wife of Prince Firas bin Raad, heads the Petra National Trust, the longest-running Jordanian nongovernmental and nonprofit organization working for the preservation, protection and conservation of the UNESCO World Heritage site of Petra. Princess Dana has been a passionate advocate of heritage protection. To overcome this, she established the PNT to inspire a national commitment to protect and preserve natural and archaeological heritage and to instill in children and youths a sense of identity and pride in Jordan’s cultural heritage. Princess Dana also underlined the importance of preservation of cultural heritage as it contributes to the global tourism industry. “The global tourism industry is a robust contributor for the global economy,” she said. According to the World Travel and Tourism Council, the size of the global tourism industry is valued at 7.6 trillion won ($6.7 billion), making fast growth compared to the automobile, financial and health care sectors. Over 20 percent of Jordan’s gross domestic product comes from tourism, while 17.9 percent of employment were based in tourism sectors. Princess Dana also shed light on transborder and collaborative efforts to appreciate and protect cultural heritage for sustainable future design. “We need collaborative efforts with government and civil society. The government should commit to working with civil society and conduct cultural projects. PNT as an NGO, when working with the government, there are strong budgetary constraints,” she said. “With other national trust organizations aligning their voice and positions strongly, we can do better as an international alliance,” she added.